The men often painted their jackets with an image representative of their aircraft's name, possibly even similar to the aircraft's nose art. Dad thinks this was Drissell's jacket. Photo by James E. Rung. Position: #3, #2 Element, Lead Sqdn., 41st “B” Gp. 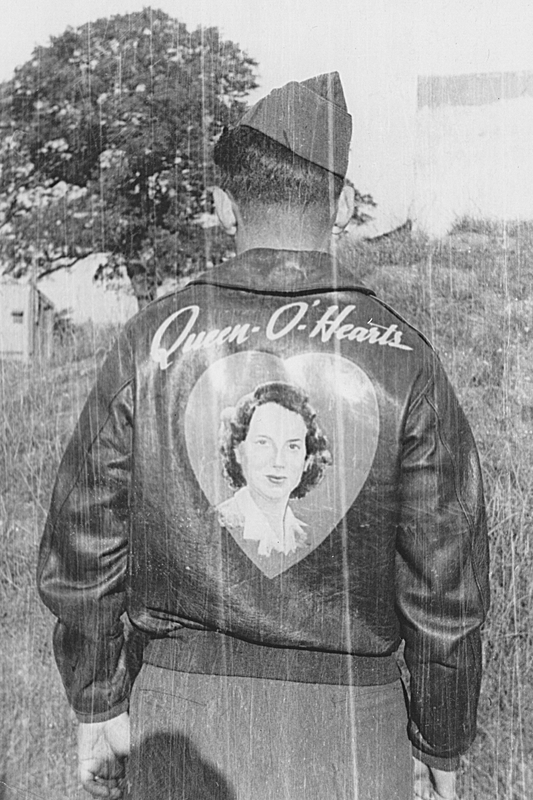 Bombs Away: 1227 1/2; 29200′; -34 degrees C.
First mission in our own plane – Queen O’Hearts. Take-off delayed two hours because of heavy ground fog. Extremely intense flak over target. Lived up to reputation of “Happy Ruhr Valley.” Skirted edge of barrage & received little damage. Tail gunner unable to observe bombing results as he couldn’t see thru the flak barrage. First – and I hope last – trip to “The Valley.” Too many flak guns!